I designed the project after looking at ideas on the internet. The sides of the frame is 30″ tall with a 5-degree angle. It is 15-1/2″ wide at the base and narrows to 10-1/2″ at the top. The front and rear are 12-1/2″ wide at top and bottom. The seat measures 15-1/2″ wide by 12″ deep and 1-3/4″ tall. The frame is 8/4 maple, assembled with twenty mortise and tenon joints. 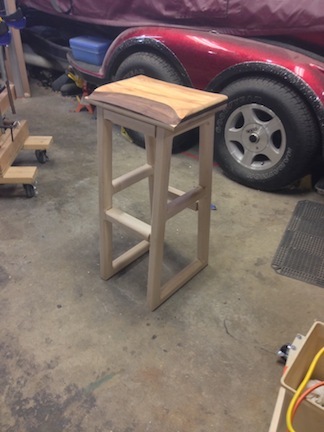 The angled mortises were created with a 5-degree plywood jig fixture on my drill press. The mortises were created using a 1″ forstner bit to make the initial cut, then cleaned up with a 3/4″ bench chisel and a 1/4″ mortise chisel. The tenons were cut on the table saw. After the glue cured on the frame, I routed all edges with a 3/4″ round over bit in a hand-held router. The top was laminated from 3/4″ birch, 1/2″ walnut and 1/2″ spalted maple. After curing and trimming to final size, I used a 1/2′ round over bit on my router table to form the sides. I contoured the seat using an angle grinder with a 60-grit flap wheel and a 5″ random-orbit sander with 60, 100 and 120 grit discs. While the spalted maple was on top, I wanted to expose the walnut and a bit of the birch for contrast (I think next time I will use 1/4″ thick boards in various species for a more striated look). The project took 16 hours over Saturday and Sunday and was a great, fun challenge. This was a great idea… taking a “simple” item and letting people do their own thing. As seen it has spawned a lot of great designs and builds. Thanks for a project that was a mental and skill builder.